The key to achieve success is to take your mind into the future and bring it back to the present. Whatever you think about and attach an emotion to, you bring about. It works every time since the universe is constructed that way. As a result, nothing can ever be created if a mind has not thought about it at first. Most People Dream of Great Achievements. Very Few Stay Awake and Fulfill Them. We are amazing powerful beings, yet many of us have just started to tap into the endless possibilities of human creations. We are most likely living in the greatest time of humanity, and also in its most critical moments of existence. It is now we pave our way to the golden age of our race or to our total destruction. Now is the time to shift our minds to the era of human awakening. We can be remembered in history as the final progression of human evolution. Never forget we are creators of our own destiny. At the same time, we are also our most destructive enemy. When we study our own enemy and learn from it, we start to understand it. Once we understand it, we can learn how to concur it and control it. When we have learned to master it, there is nothing standing in our way anymore. In case I’ve lost anyone – our enemy is ourselves. Once we have achieved and adapted to fully knowing ourselves, we attain self-mastery. When we as human beings reach this level of mastery we have total control of our destiny, events, and life itself. Self-master your thoughts, emotions and actions. Most people dream of great achievements, very few stay awake and fulfill them. What most of us do is wait for the perfect moment- in that “someday”- and then they linger in procrastination. That perfect day or the perfect opening never comes and it becomes merely a dream that’ll never be fulfilled. There are no perfect moments. Therefore, the only moment that exists is now. Therefore taking any action to achieve now is the only thing that matters. If you do not see the whole staircase, there is always the momentous first step to be taken in the direction of your desires. Act now- that’s all that counts. Problems and mistakes will follow; they are only there to teach you, to harden you, to prepare you, so you can be ready to receive your desires and creations. Thinking back in my early 20’s after reading ‘The Secret’ and ‘Think and Grow Rich’, I finally started to understand one thing- success. If we want to be good at something, we have to start studying the subject, train on it, and work hard on it. I wanted to know what success really was, so I started to study the most successful people in life and within history. What I noticed from their autobiographies, the way they lived, their paths to success – they all follow the same principals, similar behaviors, actions, and mindset. It didn’t matter if I studied successful athletes, successful politicians, presidents, successful authors, inventors, or CEO’S of Forbes 500 companies. I clearly started to see the same patterns in thinking in all of them- no matter what they were successful in. So my big question was, if I can replicate and apply the same way of thinking, the same way of handling problems, events and mindset as them, would that mean that I, too, will get similar results as they have? The answer was, definitely YES! Problems became solutions and wisdom, and fears became excitements. Doubts became courage and low self-esteem became will power at your own command. The revelations and manifestations did not just happen overnight, but I dedicated 10 years to studying the most successful people to ever exist, or still exist today. One thing is for sure, success is a word of human achievement to reach and fulfill all the goals that their own mind puts themselves to attain. Success is not about becoming financially independent or riches in money or mere materialistic things. Success is a concept of getting what the mind of that particular person wants to experience. If a woman’s desire is to become a housewife and take care of the house and the family and that makes her happy, when she achieves that, it’s called success. Likewise, if an artist has a great passion for making paintings and he succeed with making a living from it, that is also success in its own form. Every human being has different desires. To achieve them and experience them is success in all its forms. Success is a science and this science, if understood, can be applied by any human with a healthy and reasonable mind. What we focus on, we materialize. So why focus on failure when success is an option? 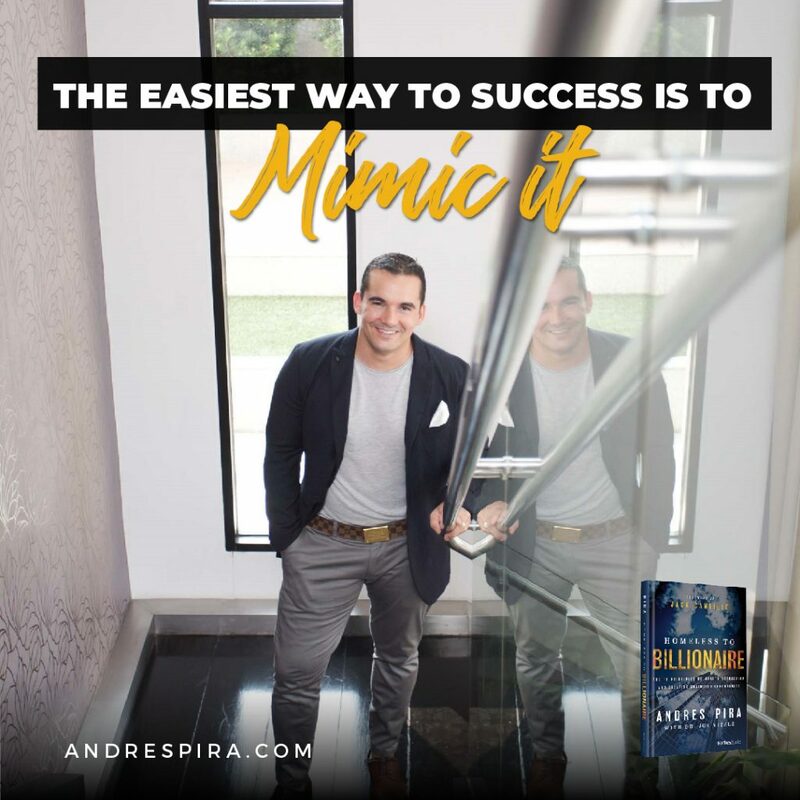 About Andres Pira – Philanthropist, Real Estate Tycoon, Author, Speaker, and Global Citizen, Andres Pira enjoys living in Thailand where his journey began from Homeless to Billionaire. Leave a comment below, and join the conversation!